We have a lil surprise for those who will listen to Bandit’s morning show Rivstart today. You guys will get a sneak preview of the brand new single ‘Sweet Bluebird Valley’… And tomorrow it’s time to ROCK at Debaser Slussen!!! Ok folks the gig of the year is getting close…. And for all you radio listeners; Tune in to BANDIT´s morning show Rivstart, on wednesday sep 5, 07:50 (AM) Johan will be in the studio to talk bout the gig of the year, new material and lots more! After a period of forced silence because of illness, THE KNOCKOUTS are back and will shatter the silence with a colossal BANG! Thursday September 6, 2012. 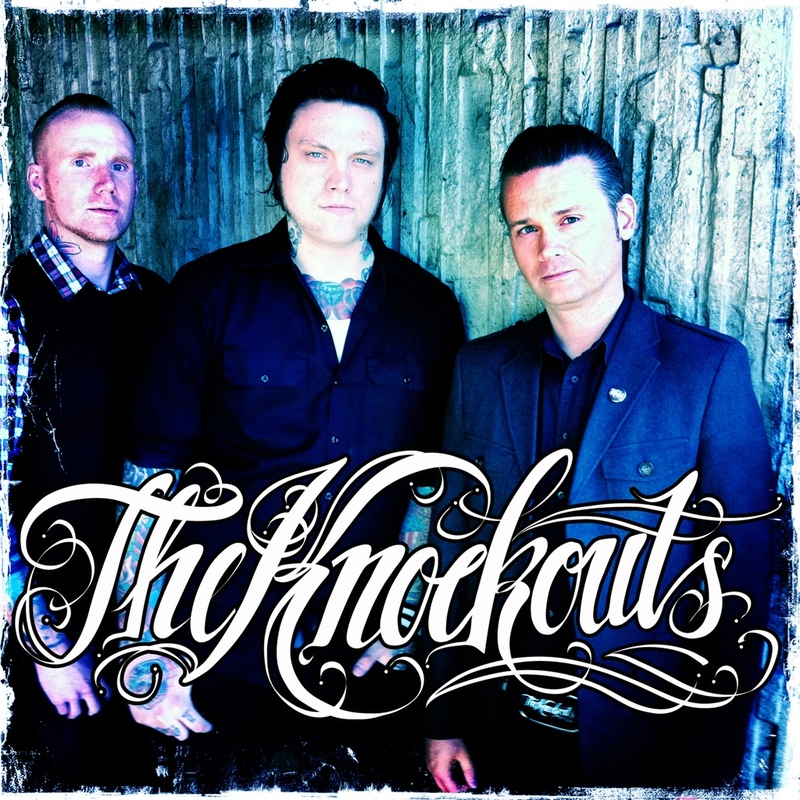 THE KNOCKOUTS bounce back with this once only, special event with their good pals Slim Jim Phantom, rockabilly cult hero of the Stray Cats, and Jonny Bowler from the Guana Batz, Nick 13/Tiger Army, both hailing from California, USA. Success has followed THE KNOCKOUTS, stealing the trophy for the Best Punk Album at the American Independent Music Awards and with the single ‘A Lie Like In Natalie’, on high rotation on the national Swedish rock station BANDIT ROCK. They have been on the biggest European rock festivals such as Peace & Love, Putte Parken, West Coast Riot, Azkena Rock Spain, and more. The success of the Album, Among the Vultures, included massive tour schedules throughout Europe. THE KNOCKOUTS were invited to open Brian Setzer’s (founder of the legendary Stray Cats) Rockabilly Riot Tour. Joining them in gigs across Europe ending with an EXPLOSION as THE KNOCKOUTS front man Johan Frandsen joined fellow Gretsch Guitars/ TV Jones endorsed artist, Brian Setzer and drummer Slim Jim on the stage for the encore performance at the Helsinki Ice Hall. 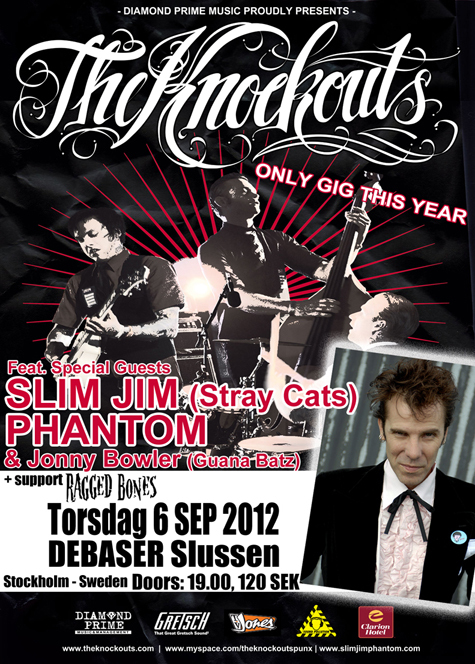 After a long friendship with Slim Jim and Jonny Bowler, the time has come for a guest appearance with THE KNOCKOUTS for one night only, at Debaser Slussen, Stockholm, Thursday September 6, 2012. A unique event not to be missed! Be there to experience the magic when these phenomenal musicians join forces and share the stage to deliver their own brand of punchy rockabilly and razor sharp country punk. As if this isn’t enough THE KNOCKOUTS will be revealing tasters of new material from the upcoming album! THE KNOCKOUTS Swedish dynamite at its best! Hi Folks! THE KNOCKOUTS will break the silence with a BANG! And will do ONE gig this year around Johan’s 30th birthday. Featuring some VERY… VERY SPECIAL GUESTS, New Material… THE show of the year!! The Knockouts have exploded onto the world stage! Further developing their huge cult following throughout Europe with Brian Setzer’s Rockabilly Riot! European Tour 2011. The Knockouts have launched headlong into the European summer with a killer performance with Brian Setzer on the premiere night of his tour at the 10 year celebration of the Azkena Rock Festival on the June 25, Vitoria Gasteiz, Spain to crowds of over 50,000 people, then onto sold out dates throughout Germany including, Berlin, Hamburg and Cologne . The tour continued to be sold out through Scandinavia with dates in Copenhagen, Denmark, Stockholm, Sweden and Helsinki, Finland ending at the famous Helsinki Ice Hall, venue capacity 8200, in Helsinki, Finland. The tour ended with a EXPLOSION! as The Knockouts front man Johan Frandsen joined follow Gretsch/ TV Jones endorsed Artist Brian Setzer and Stray Cats drummer Slim Jim Phantom on stage at the encore performance at the Helsinki Ice Hall, Helsinki, Finland, with a special rendition of the rockabilly classic, ‘7 Nights to Rock’. Brian Setzer and The Knockouts teaming up for the Tour of the Summer! THE KNOCKOUTS have launched into the European summer with a killer performance with Brian Setzer on the premiere night of the Brian Setzer Rockabilly Riot Tour at the 10 year celebration of the Azkena Rock Festival on June 25 in Vitoria Gasteiz, Spain in the heat of the Spanish summer to crowds of over 50,000 people. ……”best band at the Azkena” …. “….the crew will have to sabotage the sound to keep THE KNOCKOUTS from stealing the show night after night” !!! **BREAKING NEWS** GERMANY ARE YOU READY TO ROCK? After the success of Azkena! We are proud to announce that THE KNOCKOUTS will support BRIAN SETZER’S Rockabilly Riot on ALL of the Germany Dates – So get ready to rumble Deutschland! Heading into a massive touring schedule over summer throughout Europe THE KNOCKOUTS are taking over Scandinavia supporting Setzer on July 19 Vega – Copenhagen, Denmark, July 20 München Bryggeriet – Stockholm, Sweden, and then watch out Germany – Kicking off the German leg of the tour on July 13 at Huxley’s – Berlin, July 15 Stadtpark – Hamburg and on July 16 E-Werk – Cologne! A sneaky little TV ad for the Rockabilly Riot Tour in Finland!